Richard and Tanya Quilts: 400 GFC Follower Giveaway! Today we are celebrating our 400+ follower though GFC. Richard and Tanya Quilts has come a long long way since that first desire to quilt about a year and half ago. I would like to share a few of my favorites along the way before getting to the giveaway. The first up is the first quilt I made for Julia Hearts and Flowers it is a rag quilt made with cotton fabric rather than flannel on the top. We appliqued hearts on to some of the squares and ragged the edges of the hearts. From the beginning of our quilting, Tanya and I have not been good at following patterns or even doing things in a traditional manner. We like to mix things up and make them more creative. From mixing techniques like rag quilts and applique to doing non tradition mix of fabrics and styles. To in a sense, making a style all our own. For the first while Tanya and I made only rag quilts, and boy did we make a lot of them. Mostly this was because we could not figure out how to quilt and bind a quilt and had to go slow at doing this. Train Wrek was the first of our Quilted quilts and was like most of our quilts a quilt designed by us more out of frustration then plan. This is where I learned that you should have a plan long before you sit and quilt and have enough fabric. I have made many quilts based on ideas that I have found on other blogs and my blog following is long. When I checked today even I was amazed that on my following list is over 1000 blogs. Not all quilting, but most are. I follow too many blogs to read every one ever day any more, but I do enjoy taking the time when I do have time to read as many as I can and more importantly look at the quilts made by others. Last year my goal was to complete 52 quilts in 52 weeks. I have not gone back and figured out exactly how many quilts we made, but it did exceed that. My goals this year have shifted to maybe a little less quilts to more quality and more designed out quilts. For example I made Pillar of Fire using a pattern that I created and shared called Helix you can follow that link to download the pattern. Tanya is also working on some patterns to share this year as we try to focus a little more on quality and process and less on quantity and speed. One problem we realized early on is if I am making 50+ quilts I have to find people willing to take them off my hands. That sounds easy at first, but you have only so many friends and family to take them all. Because of this last year Tanya started our Etsy store at https://www.etsy.com/shop/RichardQuilts where we sell some of the excess items. It is slowly starting to be found and we have been able to sell a few of our quilts. 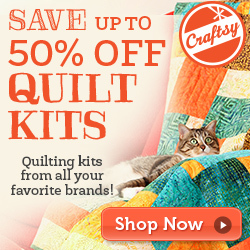 One thing you will be sure to find at our blog is a variety of quilts and quilting styles. Tanya and I both have different tastes and different styles. As a way to appeal to all audiences we have tried to make our blog and its posts available in different locations. We also started a Facebook page so we could reach out to those (like Tanya) that use it. You can find us at http://www.facebook.com/RichardAndTanyaQuilts. I am a fan of visual ideas and unlike Tanya I am not a huge fan of Facebook, but I do enjoy Pintrest and you can find us at http://pinterest.com/richardandtanyaquilts/ I love to see what people like and follow. I like to share what inspires me on it. Well enough talk, lets get to the giveaway. First I would like to thank our sponsor http://www.fatquartershop.com/ for making this giveaway possible. Our giveaway will be a $25 gift certificate to buy something you love at their shop. 1) Follow our blog in GFC, email, RSS or other following options This is required as its a follower giveaway. Leave a comment saying how you follow. 2) To support Tanya's love of Facebook go like our Facebook page and leave a comment on Facebook on the blog post for this giveaway (if so inclined share the post with your friends) This is a optional entry. No comment on blog needed as we will count the entry from comments on Facebook. 3) To support Richard's love of Pinterest find any blog post other then this one and pin a quilt or item that you enjoy. Optional Entry, no comment needed I can track pinners on pinterest if your name differs from your Comment name here just add your Pinterest name to a comment. You can also follow me on pinterest, but not required. This is optional entry. Giveaway is open until March 27th at midnight. We will also be having a baby quilt giveaway starting on March 28th (Julia's 1st birthday) on Facebook. If you are interested in that, be sure to like us on Facebook. I am a follower through your blog. I am not much for flitter or face book. I really enjoy the blog and seeing what every one is making. I follow via RSS, FB and Bloglovin. Think I got it covered! I am following by email. BTW Julia and I share a birthday! I think I was in the first 60 of your followers. I don't facebook or pinterest. I'm trying to reduce, not add, to the amount of time I spend on the computer. Congrats! Quilting is an adventure, and, ignore the 'quilt police'. They are just too scared to try anything new (unlike our grandmothers did). I follow through gfc. Congrats on the 400 followers! I follow through GFC sorry I don't facebook. I'm a follower :-) well done on your follower numbers and thanks for the great giveaway! I am a follower and have been for awhile! I liked Tanya's FB page and left a comment. I followyou on GFC and G+. I am a follower. Congrats on 400! 52 quilts in 52 weeks. That is amazing that you made even more than that. I follow you through bloglovin and e-mail. 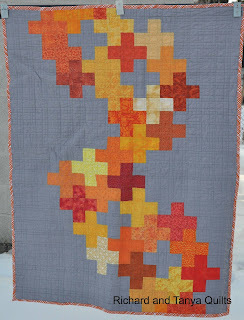 I follow on GFC, and I cannot believe you made more than 52 quilts in a year! I will be lucky if I get 5 made this year! I'm a new follower by GFC. I popped in to the Fat Quarter Shop, my frist visit there . Great assortment, I'm sure if I were to win, I'd manage to find something I liked, and a few more items on top of that. Congrats on all your followers. I am following you via e- mail and bloglovin! Congrats on 400! I follow you via RSS :) Congrats on 400!! I love to see all the quilts you have finished! I follow in reader, bloglovin and emails. Congrats on your 400! I follow you through email. Love the batik quilt you are working on. Thanks for a great giveaway. Of course I'm a follower through Google friend connect. And I really enjoy it. I follow you via Google Friend. Congrats on having so many followers in so little time! I liked you facebook page (Kathy Schaller Snider). I follow four of your boards on Pinterest already (Kathy Snider). I am an existing follower through google +. hanks for sharing all your beautiful quilts and for the opportunity on a great draw. Congrats on so many followers! I'm following on Bloglovin' now. I am a happy regular follower of your blog with GFC! Congrats on hitting 400! Congratulations! I can't believe how quickly time has passed since you first started this endeavor. I remember way back when you first started. You and Tanya have come a long way! I follow via GFC. I follow through GFC and FB. Hi guys I follow with GFC. Congrats on 400. I follow on FB also and Pinterest. GFC, FB and G+ follower. I follow your blog and receive it by email. I follow via GFC! Congrats! Follower :) (via Google Friend Connect. Congrats on 400+ followers! And congrats on all the wonderful things you've accomplished in the last year or so! Thanks to you and the Fat Quarter Shop for the wonderful giveaway. Crossing my fingers!